I like to pretend that I'm not all girly girly. And I would say that for the most part I rank pretty middle of the pack as far as feminine thrills go. But when the two main pieces of this outfit -- the skirt & shoes -- arrived at my door step (from jigsaw london & heels.com respectively) I did all sort of happy dances and skirt twirling. I've never had leather soled shoes. These things are gorgeous. And not just beautiful, but real workmanship. They smell like good yummy leather. They are soft and comfortable but will last. mmmm. I might just be a girly girl after all cause Im-a-lovin-theses-shoes! And if you are into shoes, you do need to check out heels.com -- they are those most navigateable (I made that word up, but it works) online shopping site I have encountered. Narrow your search immediately by size, color, heel height, price range... you don't have to search and search. It makes things so nice. My favorite thing they do is they have a little video for each shoe so you can see it on a live person and not just a still image in front of a blank canvas. Takes a lot of the guessing out. Check 'em out. Do you consider yourself a girly girl? Can a pair of shoes send you into a tizzy? i have so few opportunities to wear heels that when i do i just about lose my ever-loving mind with excitement! love this outfit and the colored tights. hope you had a great day wearing this! also - i think you've done some redesign here - the place looks great! 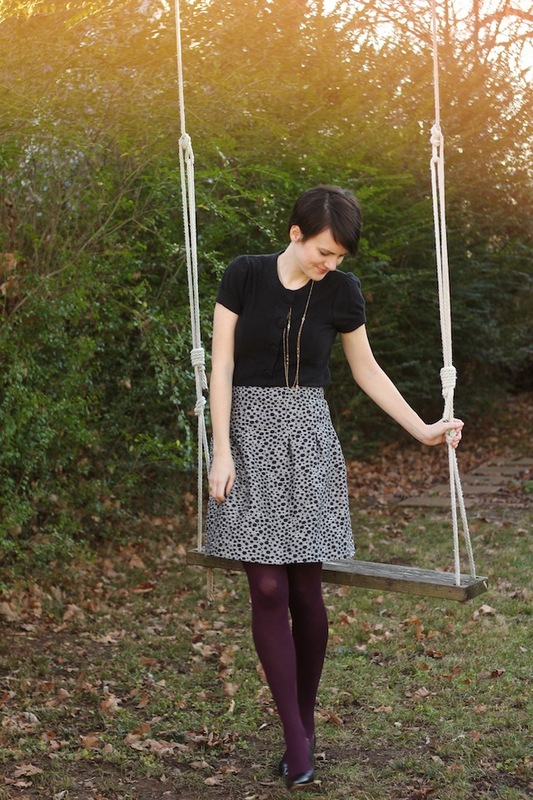 I have a pair of oxblood tights and they make me feel so girly, too. Great outfit!!! oxblood! perfect name for this color! LOVE this outfit. The tights really make it awesome. Now I'm off to explore heels.com! I am such a girlie girl!!! Through and through! I'd kill for those heels! I have never considered myself a girly girl so to speak, but some new threads and shoes are usually a sure fire way to boost my mood. I'm never sure if that's a good thing though due to the worldly treasures aspect of it?? Anywho, I just received an email yesterday that my latest "fix" has shipped and all kinds of happy dances took place in my office with that little surprise in my inbox! Betcha know what that feels like! Haha I wore it two weeks ago. Guess you weren't there. Xo love you! Amazing outfit.You look so pretty.Love you style.Getting FREE Christmas Gifts Here,http://www.japan-lingzhi-2daydiet.com/Christmas.html. The tights and shoes look gorgeous! I've definitely become more girly since High School. In H.S. I would secretly roll my eyes at the girls who got all crazy-happy over shoes, but now I see the art and (like you say) craftsmanship in shoes. Every once in awhile there is a really well-designed pair of shoes that make me really happy to see. These, make me happy. I love them on you and you can tell they are really beautiful in person. I'm not so much of a girly girl either really but I won't lie... those shoes look and sound fabulous!! Plus the idea of leather soled shoes makes me kind of excited! !